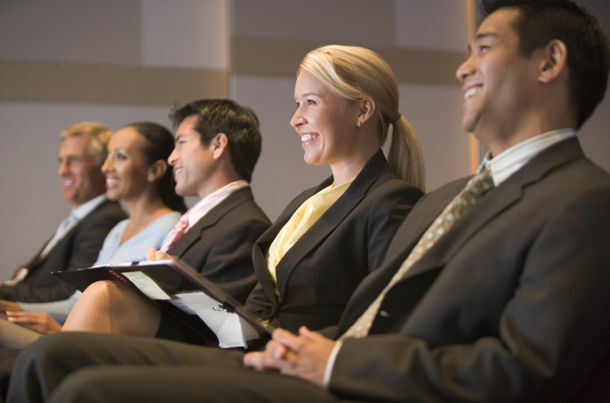 Take a look at these effective listening and note-taking tips before you attend your next conference to make your attendance is really worth it! Conferences, symposiums, workshops and other types of business and academic events are regarded as efficient ways of reaching a large group of people and conveying information. Hundreds of people from a sector come together and they go over the key ideas, principles and new currents in their field to stimulate their thinking. Thousands of events are held annually and millions of dollars are budgeted for this sector and all of these are just for one reason: sharing information. Well, what is your reason to attend a conference? If you are attending a conference to broaden your horizon, to keep up with the recent changes and expand your knowledge in your field, you want your attendance is worth it, don’t you? A perfunctory attendance doesn’t bring you anything but a huge waste of time and money. So, what you need to do is to get the most out of the event that you attend and let this brilliant source of information enrich you with new ideas and new perspectives. And the first step to take to benefit from a conference is of course listening the lectures and taking notes effectively. And considering that %80 of what you know is learned by listening, I think it’s time to remember those old school days because these simple yet highly effective listening techniques will increase your gains. So if you are a beginner in attending conferences or if you just feel you are a bit inadequate in effective listening or taking notes, I tried to outline the things that you can do before, during or after a lecture and I believe your next conference will be much more efficient in the light of these tips. First thing is to do is to be prepared before the lecture. Try to have more information about the speaker, his/her profession and what his/her speech will be about. So you outline what you can gain from this speech and your listening will be guided. Read more (but never too much) about the topic to have an overall information at least and then let this speech to fill the gaps! This study will also make you prepare some questions in advance. If the speech answers your question there is nothing to worry about but if you feel that it doesn’t, you can ask these questions to the speaker and this will raise the interaction while it strengthen your learning. Being focused and open perception will affect directly your listening. So make sure you have nothing to be bothered by before the lecture. You should neither be too full nor too hungry because both of them will affect you badly when trying to concentrate. A cup of coffee will help you focus and extra layers will comfort you if the conference hall is too cold or too hot. Pen and paper are generally provided before the lecture but have your own favorite pen and notebook because it may be more comfortable to take notes with them. Once you are ready for listening, there is nothing to worry about. You’ll just need to pay attention to some points and when you leave the hall, your knowledge about the topic will permanently be expanded. The first rule you should bear in mind is that “pay attention to the content, not to the delivery”. If you are distracted by any other things than the speech, it will be really hard to focus again so resist yourself pay attention only to the words of the speaker, not to his/her mouth, to the shirt, to the hair or to anyone in the room. And do not listen defensively. Evaluating without comprehending will prevent you from understanding the main idea. The speaker is probably making an important point by pausing, repeating, taking more time on one specific thing or changing the pitch of voice. So focus on these moments and take notes of these points. Don’t be bothered by the details and don’t get lost while try to write these down. Focus on the main ideas and facts. You need to be flexible in note taking. Otherwise, you can’t both listen to the speech and take notes at the same time. Don’t try to do so. Use abbreviations and never try to write paragraphs. Some crucial words and core points of the speech will be enough to summarize the speech afterwards. When you lose track of the speech, don’t worry. Go on listening from the point that you are lost try to find out what you’ve missed. And you’ll definitely grab it because a speech is formed of connected ideas. Writing down the first thing the speaker says in each section is useless because it’s probably the introductory part. Taking notes should not be perfunctory. First understand what the speaker is saying then write it down. Try to make connections between what is being said what you already know. Don’t be a passive listener. Thinking while listening will strengthen what you learn. If you can’t make it to listen and take notes at the same time, just focus on listening. Because if you understand the speech fully, then you can outline your own notes afterwards to go over again later. What you can do after the lecture is simple. Organizing your notes and reviewing them. Top tip is that making a neat copy of your notes is just a waste of time. Turning your notes into a diagram for example is much more effective for example. Reviewing these notes will help you fill the gaps you have in your mind about this topic before or even during the lecture. So don’t underrate these notes and leave them somewhere and forget about it after the lecture. You can also talk with the other attendees at the break and compare what you get from the lecture. It’s also a good chance for networking.